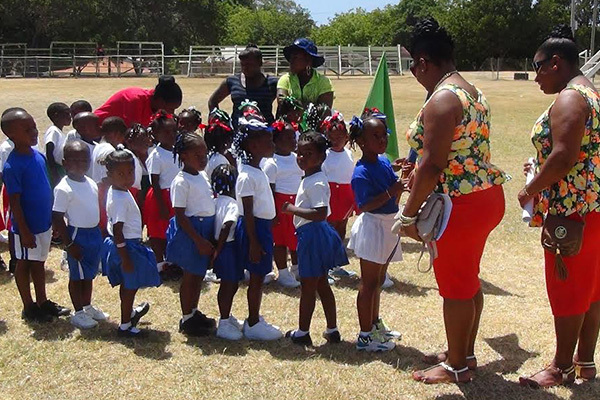 It was a tight race for first place honours as the Charlestown Pre School held its annual sports meet at the ET Willet Park on Wednesday 26th March. The meet was held under the distinguished patronage of twin sisters and former students of the school, Latonia and Lashell Jones. Both young ladies expressed delight at being allowed the honour of being the patrons on the special day and wished the athletes every success. There was an impressive march past by the three competing houses: Green, Blue and Red and later the little athletes were met in person by the two distinguished former top athletes. Thereafter, there was an intense battle between the houses and for most of the afternoon, the scores remained very close to each other with Green house at one point having a mere one point lead over Blue. The children tested their skills in races such as the hopping race; dress up race; fill the bucket; tyre race and flat races. Some of the races were so coordinated in order to ensure team work among the athletes. The parents also had their fun at the end of the day, as they entertained with races of their own.